In the fast-paced, fiercely competitive electronics industry, the ability to combine consistently high standards of quality and precision with maximised productivity, low production costs and fast process times is essential. Offering huge flexibility across a vast range of manufacturing processes, automated solutions make achieving this synthesis relatively easy. 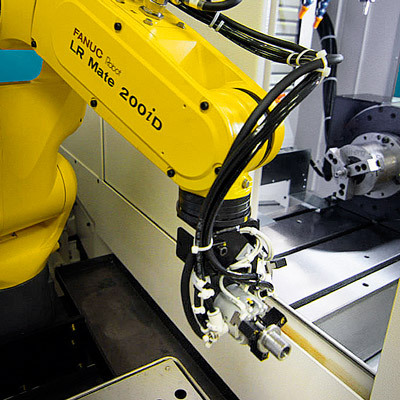 FANUC machines have been designed to deliver extremely repeatable precision, exhibit rock-solid reliability and create efficiencies that significantly drive down your costs. What is more, they provide you with the flexibility to respond dynamically to market trends and demands. Whether you want to automate your entire production scenario or just a small part of it, FANUC has a solution that is not only suited to your needs but will also help to future proof your business. Optimise your value chain right from the very start of the production process using FANUC front-of-line automation. Depalletising, loading and unloading, or line charging – these and many more front-of-line tasks can easily be automated using FANUC’s smart system applications. Ask us about automating electronics manufacturing and speeding up your production processes now! The manufacturing and handling of electrical parts represents the most delicate stage in the processing chain. Whether it is high-precision turning, parts handling or assembling, milling operations or even metal finishing, FANUC’s tailor-made solutions make it possible to automate almost any conceivable handling operation. In a demanding industry like electronics, quality is the main factor of success. Automating the manufacture of high-precision electronic components using FANUC CNC machining centres not only pays off in terms of precision and accuracy but also in extremely low defect rates. To help you produce high numbers of small electrical components quickly with maximum repeatability smart functions such as Precise Metering 2+3 or AI metering control compensate for changes in material viscosity and other variables. 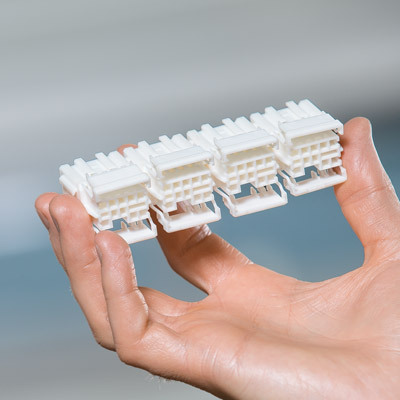 Additional features ensure highly repeatable micro moulding of very small parts. Learn more about what ROBOSHOT can do for you. FANUC M1 delta robots arrange contact parts in membrane keyboards. Featuring integrated vision and benefiting from user-friendly operation, delta robots can work side-by-side with humans to provide an efficient and cost-effective supplement to manual labour. The latest drive and control technology achieves high precision, with an integrated industrial PC attached to the machine making automating your production especially user-friendly and flexible. Ensuring pristine surfaces and incredible accuracy of parts, ROBOCUT’s extensive range of options make it the perfect electronics industry all-rounder. This cell uses FANUC solutions to produce household and commercial electrical boxes. 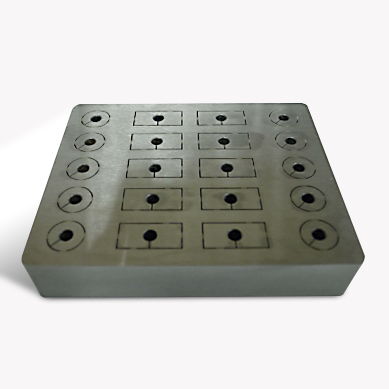 Intelligent features include iRVision for part detection and positioning, pick and place, assembly, error proofing and part rejection. FANUC automation systems are completely reconfigurable. Why not customise your production as well? Automating pick, place or sorting tasks, not only enables you to optimise your production processes but also to react flexibly to new trends, thus staying ahead of the competition. Equipped with FANUC’s vision systems iRVision, FANUC pick and pack robots maximise productivity on even the most demanding of operations. Smart visual recognition technology and sensor systems further enhance these processes. FANUC handling and palletising robots take the strain out of line processes and increase productivity. 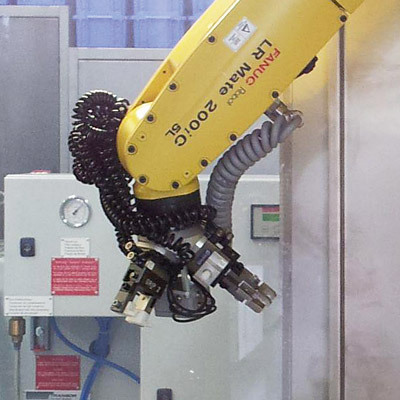 With a vast range of low to high payloads, different reaches and mounting options to choose from, FANUC is bound to have an industrial robot that is ideally suited to your process. At FANUC we think creatively - and are experts when it comes to automation solutions. Why not let us inspire you with innovative solutions designed to meet the needs of your industry? No matter what it is, we will show you every conceivable aspect of your electronics production line that can be automated.